When Jesus said, “Go into the whole world and proclaim the Gospel to every creature,” his apostles clearly took that very seriously. Nowhere is that more apparent in the Philadelphia Archdiocese than at the annual Cultural Heritage Mass celebrated this year by Archbishop Charles Chaput at the Cathedral Basilica of SS. Peter and Paul on Saturday, March 23. Approximately 30 nations were represented with colorful banners and in many cases distinctive costumes. There would have been many more if not that arrivals from Spanish-speaking lands are so numerous they have their own annual Hispanic Catholics Mass at the cathedral. Pride of place at the head of the parade of nations in the entrance procession was given to the very first arrivals on America’s shores, led by Buffy Red Feather Brown, a Cherokee chief and Philadelphia’s second most famous Catholic Native American. Chief Red Feather, who gave opening remarks before Mass, used the opportunity to welcome all of the nations and also took the opportunity to express her strong feelings on the clergy abuse scandal that has rocked the Catholic world. 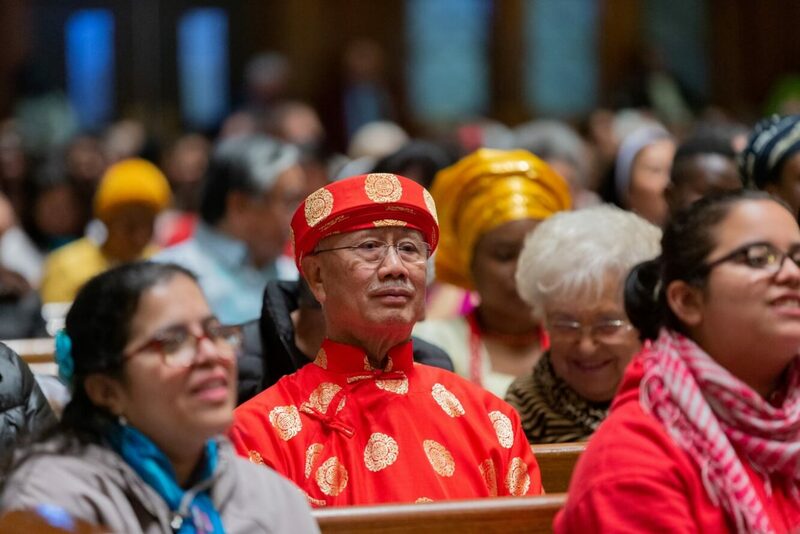 In addition to those in the procession, there were 10 choirs singing in various languages, colorful dancers and readings and prayers in eight languages including Filipino, Malayalam, Urdu, Ghanaian, Vietnamese, Lithuanian, Knanaya and English. Giving the Mass celebration itself an ethnic flavor was Archbishop Charles Chaput as celebrant, and himself a proud member of the Native American Prairie Band Potawatomi. Adding an international flavor was the presence of Archbishop Roger Houngbedji of Cotonou, Benin, as a concelebrant. Sam Labou, who attended the Mass with a group of 55 men, women and children from Liberia, explained his group normally worships at Divine Mercy Parish in Philadelphia. “It’s wonderful we can express our faith the same way we did at home,” he said. Since coming to America he’s lived in different cities but “Philadelphia is the most diverse I’ve seen,” he added. But not everyone at the Mass was first generation Americans.